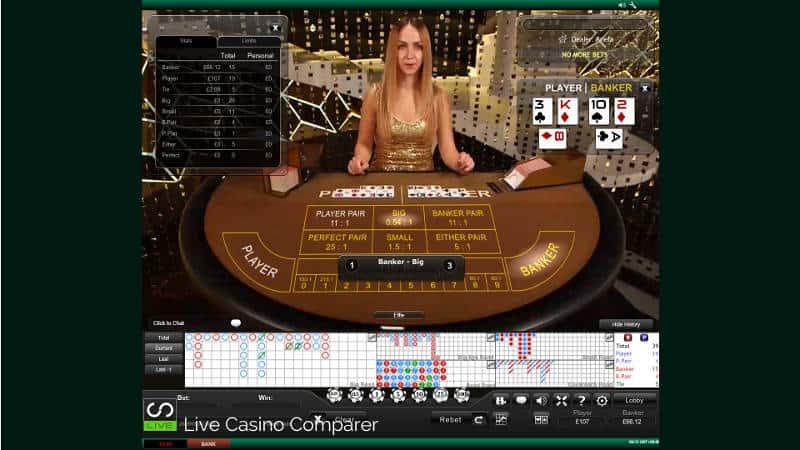 Playtech Live Baccarat Review - All the playing options reviewed. 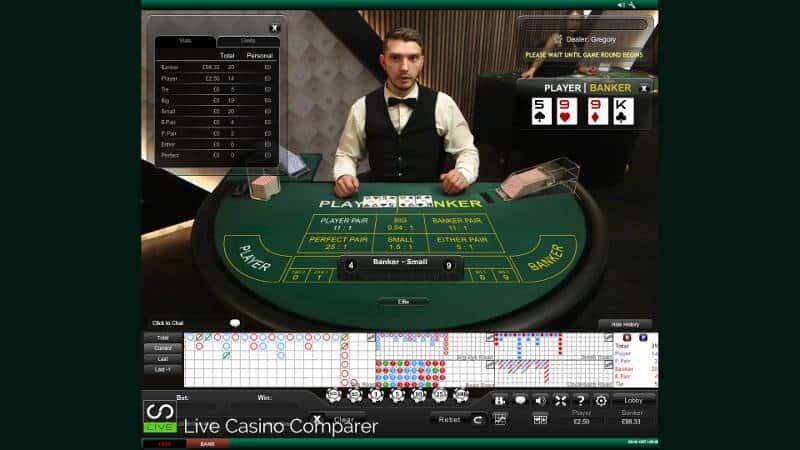 In this review of Playtech Live Baccarat you’ll discover a great selection of Live Baccarat tables with a good choice of playing options. There’s something to suit every player type. Whether you like to see the cards squeezed, want to play a quick game, need lots of side bets or an opportunity to win a Progressive jackpot, there’s a table for you. If you don’t like reading lengthy reviews, watch my Video instead for a full unbiased look at Playtech Live Baccarat. Did you Know? – There are 7 Seats in multi player Baccarat, but you’ll never see a Number 4 Seat. Number 4 is unlucky in China as it sounds like Death. So you’ll see a position 8 instead. 8 is a very lucky number in China as it sounds like Prosper or Wealth. Playtech has standardised all of their Baccarat tables. The table design may differ on some, but the core game functionality and rules remain consistent across them all. You’ll probably spot that some of the tables have enhancements. I’ll explain those as I get to them further down the page. Each Playtech Live Baccarat game is played with an 8 deck shoe. It gets re-shuffled when approximately 2 decks remain. Before the start of each new shoe, cards are “burned”, i.e removed from the beginning of the dealing shoe before the first hand is played. The number of cards removed is determined by the value of the top card in the deck. All tables have side bets of Banker & Player Pairs, Big/Small and Egalite. One table has a Progressive Jackpot. Some tables have a No Commission version. There’s two versions of the playing interface, New and Old. All tables display full baccarat road maps. 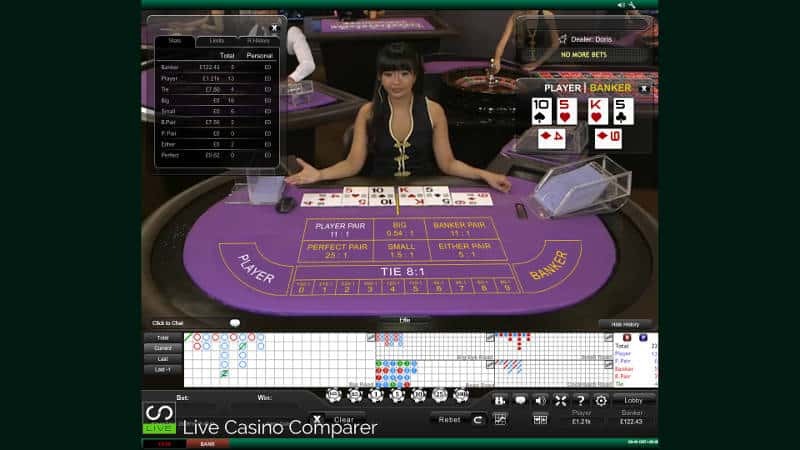 Playtech Live Baccarat can be played on all device types, Desktop, Tablet and Mobile. The amount wagered for Player or Banker or Tie is displayed on the new playing interface. Card Scanners now sit in the middle of some tables, enabling all cards to be dealt before they are scanned. This, in addition to the 3rd Cards also being dealt up front, means the game can progress more quickly. If the 3rd cards are not used in the hand they are used in the following hand. All betting and game round times should be treated as approximate times. I recorded several hands on each table and found the times vary slightly depending on how closely the dealer is paying attention and whether 3rd cards are used. 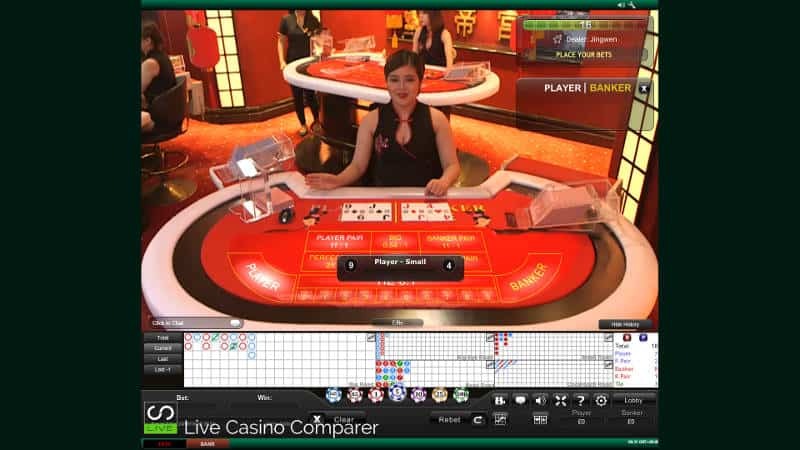 What’s the difference between Baccarat and Mini Baccarat offered at Live Casinos? I feel stupid now I know. 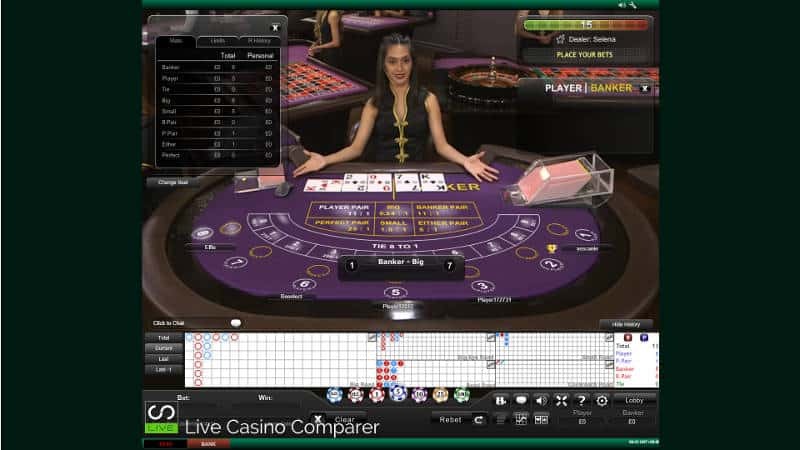 I’ve been looking all over the place to discover the difference between normal Live Baccarat and Live Mini Baccarat. You know what it is? Nothing. There is no difference. It’s a historical thing. Mini Baccarat was developed when a Full Baccarat game consisted of 14 players, with each taking turns to deal the hands. A quicker, smaller version was needed that would also be dealt by a dealer. Thus Mini Baccarat was born. Playtech for some reason has used the name on some of its tables. I can’t explain why! As I mentioned above, all the Playtech Live Baccarat tables offer a full range of side bets. 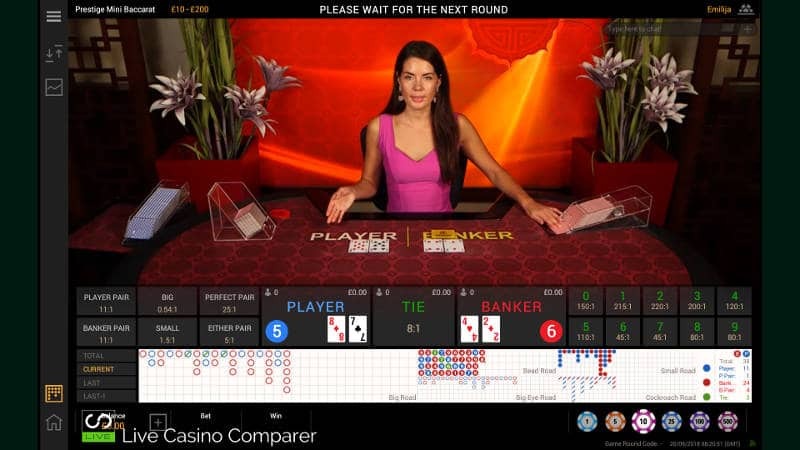 Banker/Player/Either/Perfect Pairs – A bet on whether a pair will be dealt to any of the hands. Depending on the type, payouts range from 5:1 to 25:1 for a Perfect Pair. Big/Small – A bet on whether the total number of cards dealt is 5 or 6 (BIG) or 4 cards (SMALL). Egalite – This is a bet on the value of tied hands. Payouts range from 80:1 for ties on 6&7 up to 220:1 for a tie on 2’s. This bet can be placed without placing a main hand bet. Playtech provides 5 Road Maps for each table. These show the trends of the shoe, all based on the past hands. Each road map displays information from the shoe in a different manner, so there’s probably a road map that displays the stats in the way you like them. You can pick from the Big Road, Bead Road, Big Eye Road, Small Road and Cockroach Road. A full explanation of how the different roads are constructed can be found here. 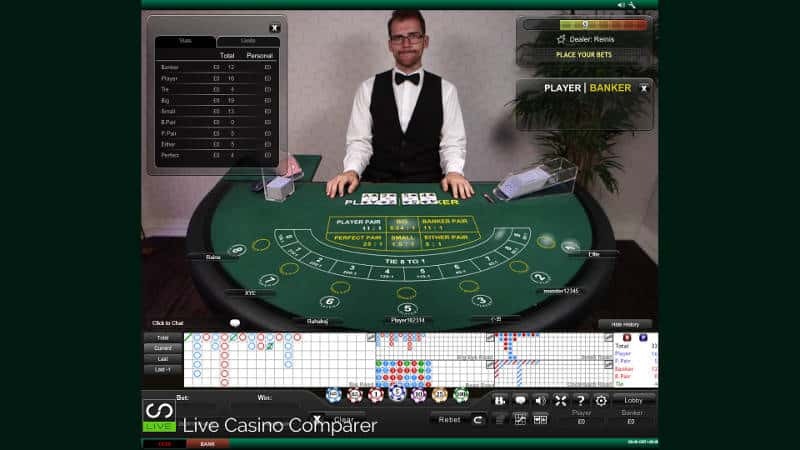 If you’re interested in finding out how to use the road maps check out my Baccarat Betting Strategy where I explain what I do. Baccarat Squeeze brings a land based tradition online. It’s the custom for the player that’s wagered the most on a hand to be able to “squeeze” the second and third cards on a hand. It’s the traditional way Baccarat is played and now the Squeeze can be watched on the Playtech live baccarat tables. The only difference is the dealer performs the squeeze. This obviously adds a significant amount of time to the game round. Betting time is about 14 seconds with a full game round taking approx 1 minute 22 seconds to complete. Speed is the essence in this version of Baccarat. There’s 18 seconds of betting time, with the whole game round taking a very quick 34 seconds. This is achieved by dealing all the cards face down during the betting time, including two extra cards to be used either as third cards or as 1st cards for the next hand. Card scanners built into the table speed up the whole process even more. Golden Dragon Baccarat is played on a smaller than normal table with a traditional layout. The backdrop displays a traditional Chinese dragon in colourful gold and reds. Betting time is 20 seconds. The whole game round takes 43 seconds. The table shares the same studio with Golden Speed Baccarat. Slightly larger than normal playing cards are used to help with player identification, although personally I still rely on the computer generated images to see the cards. 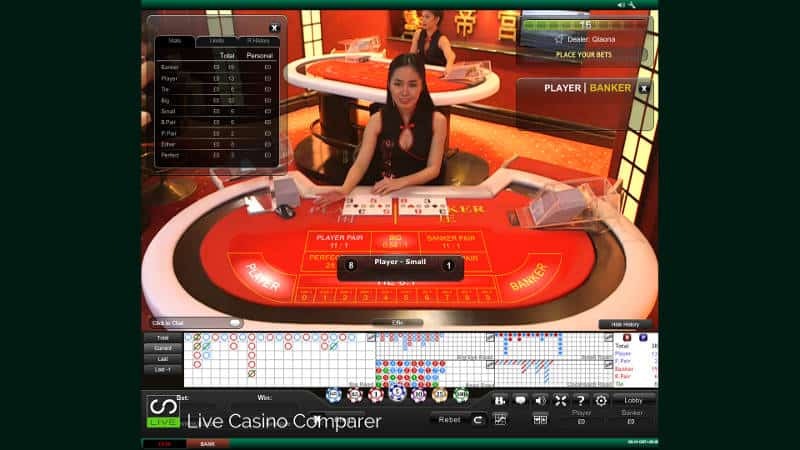 Prestige Mini Baccarat is streamed in Full HD and was the first baccarat table to get that treatment. It’s not a quicker game by any means, despite the name, with a betting time of 14 seconds. A full game round take about 1 minute. It’s my favourite table by far. The images are crisp and the audio is very clear. The longer game round allows the dealer to engage in chat more, which I really like. I’m not so much a fan of the darker environment, but I can put up with that for the excellent playing experience. 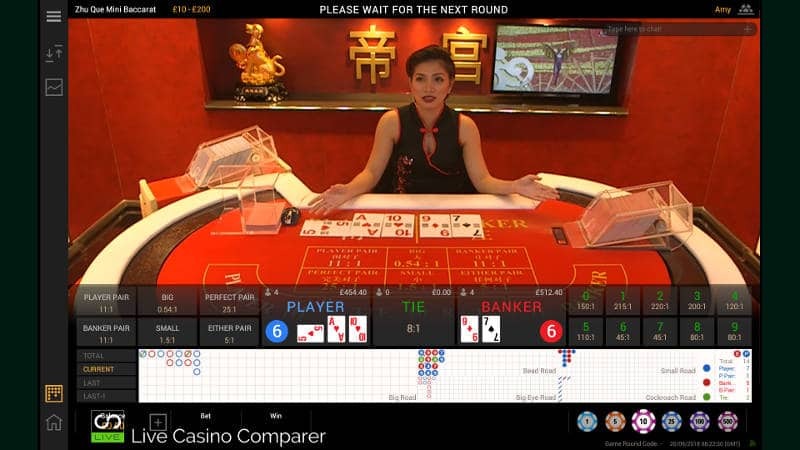 Zhu Que Mini Baccarat has resident Mandarin speaking live dealers. This table will appeal to Asian players more than English speakers, but, if you want to play on a table with a little bit more life in it, this may be the one. Betting time is capped at 18 seconds, while the full game takes approx 47 seconds. This compares favorably with the other tables. 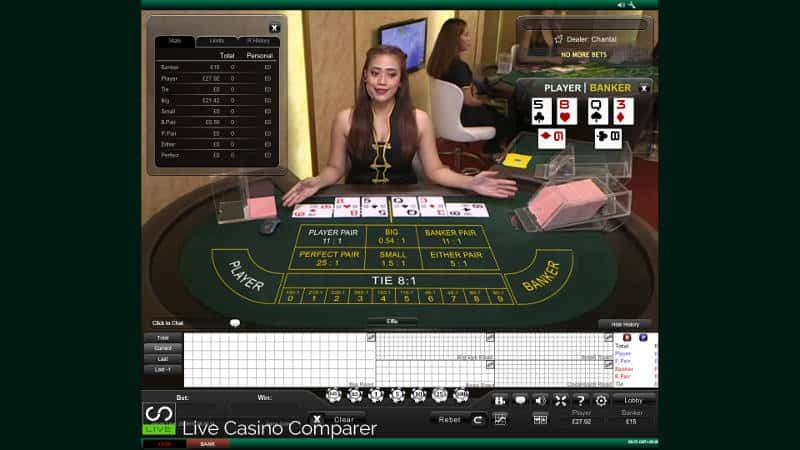 Playtech Fushi Mini Baccarat is streamed live from the Emperor studio in Manila. It’s another table offering Mandarin speaking dealers, so will attract more Asian players than European. The colour of the studio is almost the same as the tables at MarathonBet, with Red/White being very prominent. The playing interface is the older version, which doesn’t look as good as the newer replacement. However it’s functional and gets the job done, so no real complaints there. Bets are placed directly on the table and there is a complete range of side bets to choose from. Betting time is 16 seconds and a complete game round takes 42 seconds. 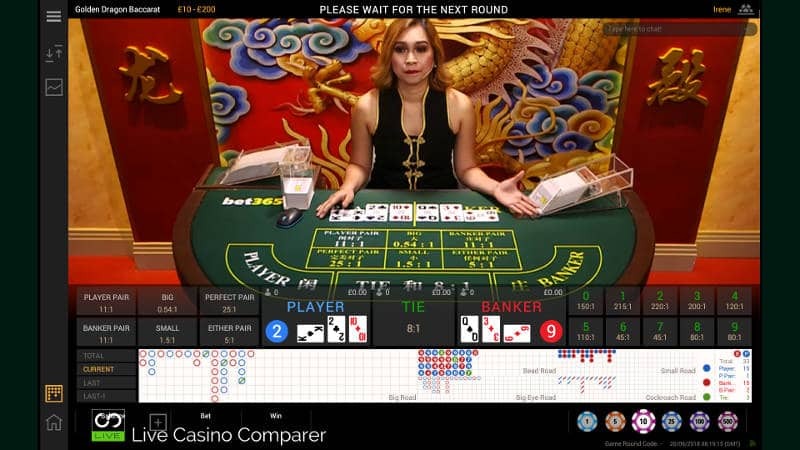 Topaz Speed Baccarat is streamed from the studio in Manila. It utilises the older playing interface and large playing cards. Betting time is kept to 12 seconds while the entire game round takes an impressive 36 seconds, very similar to Golden Speed Baccarat. The table has the more traditional layout and you place bets using the grid superimposed over the table. For those that like to see how the shoe is trending 5 Road Maps are on permanent display across the bottom of the playing interface. 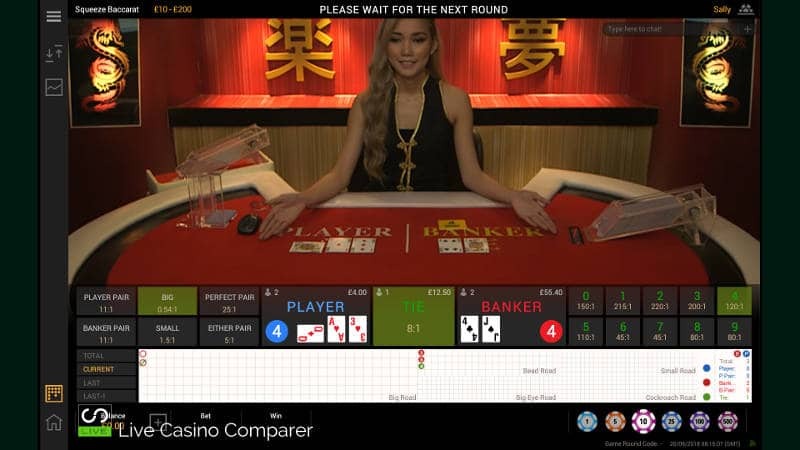 Golden Baccarat uses the modern playing interface and also one of the latest tables. This table has scanners at each Player/Banker position and also where the two “extra”cards are placed. Although not a “speed” table, this game is quick and that’s down to how the cards are dealt. All cards are dealt face down and then scanned and revealed when the 18 seconds betting time has completed. It takes a further 18 seconds to complete the game. I really like this table. Along with Playtech Prestige Roulette it’s my favourite. I’m not going to lie, Playtech Grand Baccarat is a real disappointment to me. I just don’t understand why this new table in the new Riga Studio with all it’s glitz is still using the old playing interface. It could look so much better and be a real advert for their live dealer Baccarat. As games go, it’s another quick one, with a betting time of 12 seconds with a full game taking 30 seconds. On a par with the Speed tables. Playtech Lounge Baccarat is a 7 seat game, rather than unlimited as most of the other tables are. You select your seating position when you join the table. Note that there is no position 4 and there is a number 8. The table has a traditional look and uses the older playing interface. Betting time is 15 seconds and the game round completes in 27 seconds. Playtech Opal 7 seat Baccarat is another 7 seat Baccarat table. Again, it looks old school but it has a charm about it which I really like. I guess I’m a sucker for the Philippine studio, the dealers and the colour scheme. Not as quick a game as Baccarat lounge. Betting time is 16 seconds with a play time of 37 seconds. There are three Playtech Mini Baccarat Tables. Mini Baccarat, Crystal Mini Baccarat and Sapphire Mini Baccarat. 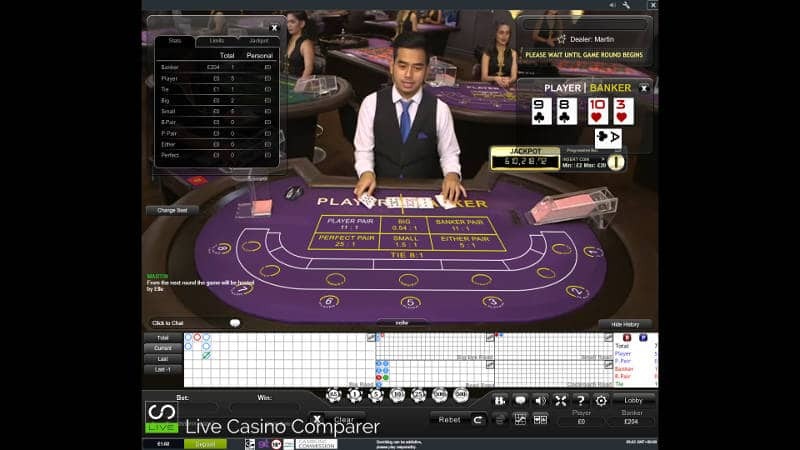 It’s exactly the same game on each of the tables as normal Baccarat, when you’re playing against a live dealer. Mini Baccarat is played on a traditional looking table using the older Playtech playing interface. With No Commission Baccarat, Banker and Player hands are paid at Even money, rather than the standard 0.95-1 on Banker wins. The exception is when the Banker wins with a 6. In this case winning hands are paid at 0.50 – 1. This is where the house makes it’s edge. A No Commission Baccarat option is available for most of the tables. You’ll have to load up a separate instance for payouts not to have commission applied to Banker hands. The Progressive Jackpot is an additional side bet that’s available for casinos to opt in to. The jackpot is seeded by 7% of each jackpot bet. 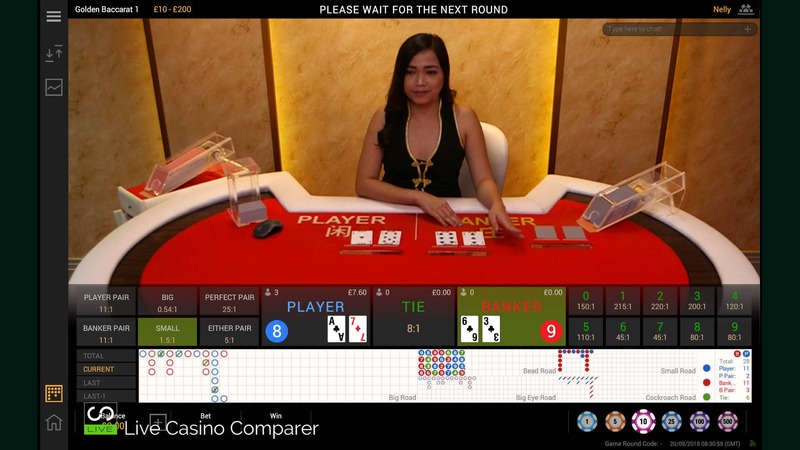 The Jackpot is paid when the Banker and Player hands both have matching suited Ace and 8 as their hand in the same game round. There are other prizes available for lessor hands. Suited Ace & Eight – 10,000 – 1. Ace & Eight – 1,000:1. Natural 9 – 25 :1. A Natural 8 – 20 :1. Natural 7 – 15 :1. Natural 6 – 10 :1. As Live Baccarat goes, the Playtech version is right up their with the best. It’s pretty close to how Evlution present their games, but has the additional benefit of Asian studios with Mandarin speaking dealers. The Progressive Jackpot is also unique to Playetch. Personally I prefer the Prestige table, as it’s more intimate, you can hear the dealer speak clearly and the visuals are very good.